AMS designed the Alpha Performance R35 GT-R Race X Intercooler upgrade to be the best-performing 1200 HP front mount intercooler on the market. It certainly had to be in order to meet the requirements of our team of 7 second “Alpha X” GT-R’s! If your GT-R produces in excess of 1200 horsepower, especially if you drive in a hot weather climate, the Alpha GT-R Race X Intercooler is your best option for producing power safely and efficiently. After testing, re-testing, and a host of refinements, this 7 second race-proven design has been perfected and now available for your high horsepower R35 GT-R.
To effectively reduce charged air temperatures, we employed a vertical flow design for ultimate cooling. 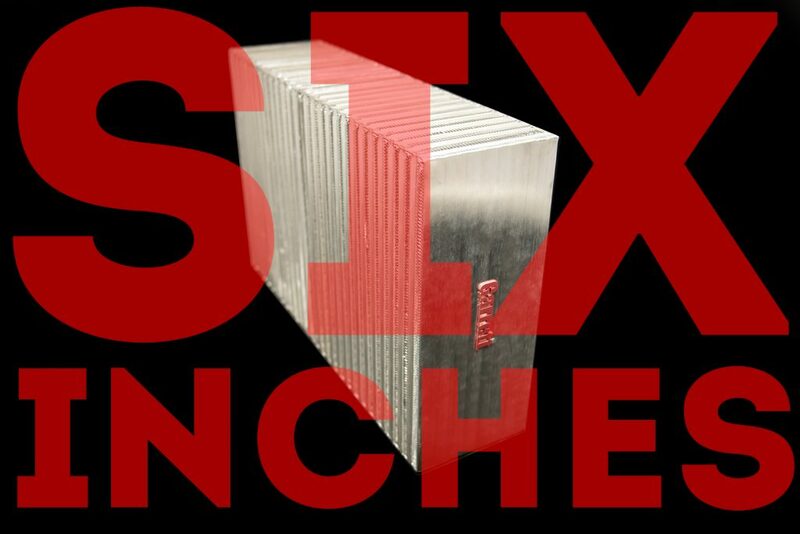 With its massive 22.2″ x 14″ x 6″ bar-and-plate core the Race X offers148% volumethan a stock pair of GT-R intercoolers. That is 1800sq inches of cooling! 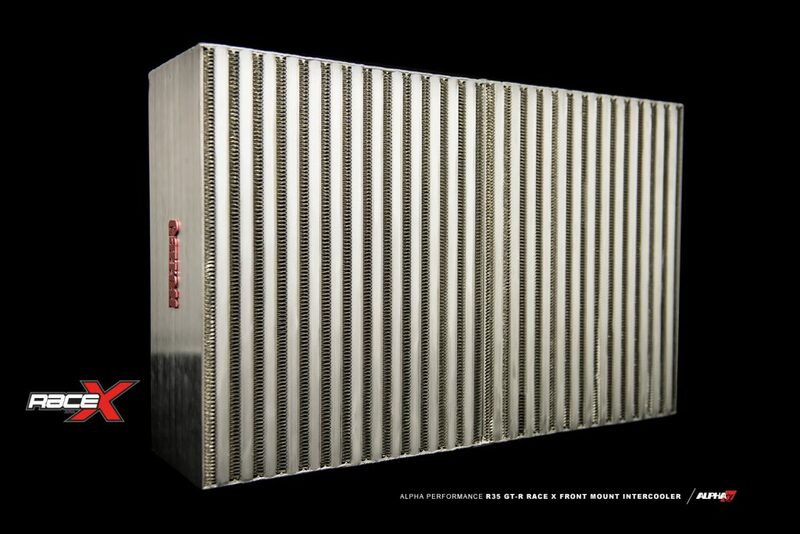 The core features up to twice the fin density of most intercoolers currently on the market. This allows for more contact with cool, dense air which allows for the most pavement shredding power output you can get for your GT-R! In our test vehicles making1700 whp we saw a 20_f difference at the end of the mile between our standard Race FMIC and our new RACE X Intercooler. AMS’ Snailworks© engineering team designed the Alpha GT-R Race X billet intercooler end tanks with extremely smooth features and geometry for the best flow resulting in maximum horsepower. Designed using Solidworks© 3D CAD software, these end tanks have improved flow over boxy sheet metal end tanks found on our competition’s inferior intercoolers. These large end tanks feature 3-inch CNC billet inlet and outlet ports to provide a smooth, tapered transition from intake to intercooler. Our team went even further by computer designing precisely molded, custom silicone couplers to provide perfect fitment and optimized geometry for improved airflow volume and velocity – providing unmatched power without sacrificing response. This intercooler kit takes full advantage of the GT-R’s available frontal area while improving functionality of the stock intercooler shroud. For even better channeling of air, a supplied bridge plate and shroud plates create a tight seal surrounding the core. This seal ensures that cool air entering the shroud is funneled through the core. The plates stop air from escaping through the sides, above and below the intercooler maximizing the efficiency and effectiveness of the intercooler core. These are features often overlooked by the competition. This intercooler does require cutting of the factory crash beam and riveting or welding in the supplied beam plate. Just like all Alpha GT-R components, there is absolutely no doubt about durability, reliability, and fitment of this intercooler. 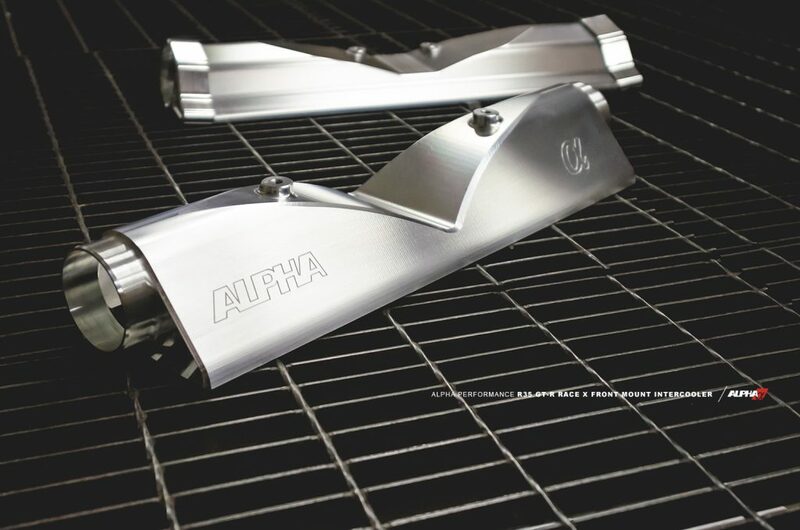 Our Alpha GT-R Race X Intercooler mounts firmly to the core support with gusseted aluminum brackets. All 5-ply silicone couplers provide superior strength and fasten securely using Murray Turbo Seal clamps. The intercooler itself is pressure tested to 50psi and checked for leaks in order to pass inspection. All of this is done to ensure your Alpha GT-R Race X Intercooler lasts the lifetime of your high horsepower GT-R! 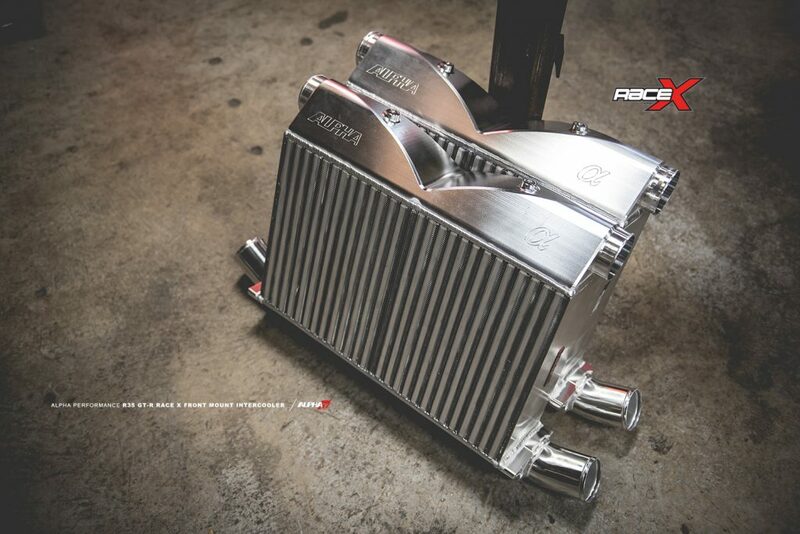 Order your Alpha Performance R35 GT-R Race X Intercooler today!